The availability cascade or truth effect is a self-reinforcing cycle in which information is perceived to be plausible and correct due to its increasing repetition in the public domain. The effect was first named as the result of a study in 1977 in which participants were given a list of 60 factoids which were believable, but people wouldn’t necessarily know. It included statements such as “Large migration of Chinese railroad workers begin in the 1880s” and “The first air force base was launched in New Mexico.” Participants had to rate their belief that a statement was true for each statement on a scale from one to seven. The exercise was repeated on three occasions with two weeks apart. A third of the statements remained constant throughout and the rest of them were new. Analysis of the exercise showed that the grading of the repeated statements rose from 4.2 in the first session to 4.6 in the second session and 4.7 in the final session. The rating of the remaining statements showed no noticeable pattern. What triggers an availability cascade? Availability cascades occur due to information being circulated and discussed in the public domain by traditional media (e.g. newspapers and TV) and/or across social networks (e.g. word-of-mouth and social media). 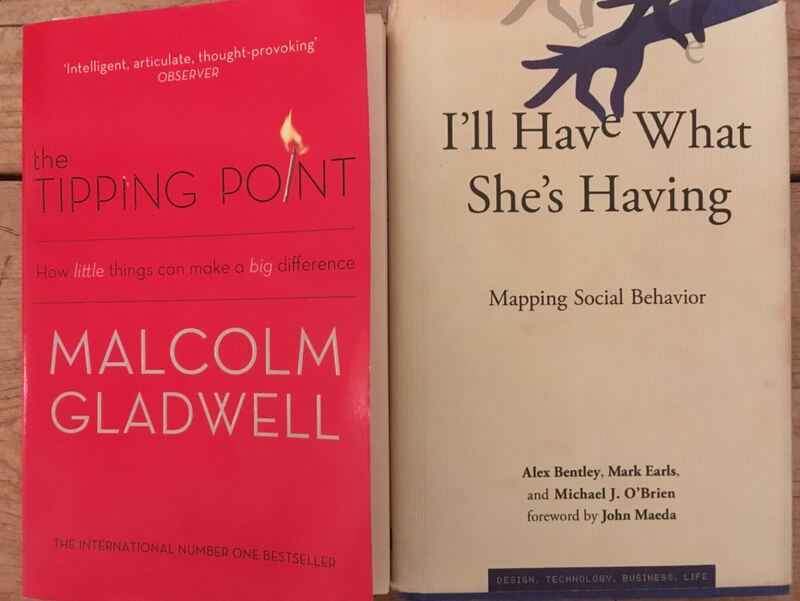 In The Tipping Point, Malcom Gladwell suggests that there are three types of agents involved. Connectors – These are people with a natural ability to form and maintain long-term relationships with a wide range of individuals. They have an instinct that helps them relate to people and see possibilities that others don’t notice. Mavens – These are people who are passionate about collecting and sharing specialist knowledge. They are prepared to research topics of interest in great detail and are socially adept at passing the information onto other individuals they interact with. Salesmen – This is someone who very expressive and is good at persuading people around to their way of thinking. However, this is often not just about what salesmen say. Gladwell’s research suggests that non-verbal cues are just as important and sometimes more important than verbal cues. Salesmen tend to be very good at expressing emotions and feelings and as a result they are much more emotionally contagious than the rest of us. Kuran and Sunstein focus on the importance of availability entrepreneurs. These are people who are prepared to commit resources into communicating a belief for some personal gain. Whatever we call these agents the evidence suggests that multiple types of actors need to be engaged for an availability cascade to occur. The other factor that has a big impact on whether an availability cascade forms is the nature of the message. Gladwell refers to this as how “sticky” or engaging the idea, product or behaviour is perceived. This is difficult to define, but it should remind us that unless there is something compelling about what we want to share it is unlikely to grow into anything significant. For marketers the benefit of an availability cascade can be huge as it can trigger new trends and dramatic changes in demand for products or services. However, for an idea, product or behaviour to cascade you not only need the involvement of different types of agents but you also need something “sticky” or compelling to share. This demonstrates that influencer marketing is not as simple as engaging people with influence. Influencer marketing tends to focus solely on connectors. This is a flawed approach as you should also seek to engage mavens and salesmen so as not to put all your eggs in a one basket. This will increase the chance that more than one type of agent engages with your campaign. There is, however, a lot of luck involved in triggering an availability cascade and so there can be no guarantees of success. Social media is often cited as a means to generate a social buzz around a brand. Certainly brands can use social media to allow people to share ideas or experiences with ease. However, research estimates that only 7% of word-of-mouth is online. As a result off-line word-of-mouth and other peer-to-peer influence (e.g. non-verbal behaviour, traditions and social norms) is much more important for real-world sales or behaviour. Indeed, research by Facebook’s Head of Marketing Science found there is no correlation between Shares, Likes, clicks and real-world effectiveness. The availability cascade demonstrates that influencer marketing is more complex that just engaging with people of influence. There is also much more luck than marketers might like to think. Brands should focus on developing concepts or products that are “sticky” or what I refer to as compelling. Once you have created a compelling proposition there is a greater chance of success if you encourage off-line word-of-mouth. Seek to engage a variety of people as there is no single type of agent who triggers an availability cascade. Online word-of-mouth also has a role for brands wishing to share digital content and ideas. Reciprocation can be a useful way of beginning this process. If you offer something for free or at a discounted price people often feel obliged to return the favour.